Winter is approaching, and it's once again time to make plans for the annual Snowcamp. It will take place over the Martin Luther King Holiday weekend. The location again is the Sahara Creek Horse Camp, a Washington State DNR property. It is located about 5 miles from Elbe, WA on SR 706, on the way to Ashford and Mt. Rainier. There is a SMALL sign located at the entrance, which is on the left, about 100 feet beyond Milepost 5 (the milepost is on the right side of the road) on SR 706. 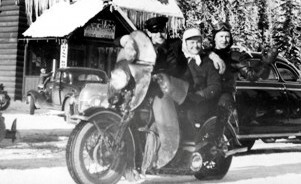 Above: Snowcamp for motorcyclists is not something new in the Pacific Northwest. Les Annan snapped this photo in Stevens Pass in the late 1950's. As in the past, the event itself is free. However, a Discover Pass is required for motor vehicle access to Washington state parks and DNR facilities (the Horse Camp, as noted above, is a Washington DNR facility). The annual pass is $30; a one-day pass is $10. The annual pass is now good for 2 vehicles. Our experience last year indicates that sometimes during the weekend the passes will be checked. Since the penalty for not having one is $99 we highly recommend getting one if you plan to attend. Discover passes may be purchased online at www.discoverpass.wa.gov, by phone 866-320-9933, or in person at fishing and hunting license vendors and manned state parks offices (transaction and dealer fees will also apply). Above: Taking a ride to the snowline now. OK, so much for the bad news. If you are not familiar with the event, we bill it as "a chance to be cold and miserable with like-minded fools' It's basically a winter motorcycle campout, but we don't care if you come by motorcycle, car, or RV. A Friday night chili feed is provided, as are pancakes for breakfast. You're on your own for other meals, but in reality the event is a giant potluck and an epicurean delight. To date no one has either starved or frozen to death, so make plans to join us for this great event. For more information contact Rolf Gabbe (rolfgabbe@yahoo.com, or 253-770-3749).